The Gefen EXT-HD-1000KIT30B is an HDMI Fiber Extension system bundled with 30ft of 4 strand LC-LC cable. This HDMI Extender allows an HDMI video signal to be extended up to 330 feet (1640 w/o HDCP) using a multi-mode LC-LC fiber optic cable. The Fiber Optics technology allows the HD-1000 to carry video signals over long distances. Fiber Optic cables are immune to video signal corruption from electromagnetic interference (EMI), ensuring a crystal clear picture. The HD1000S sender unit sits next to your set-top box or DVD player source. Cables supplied with the HD-1000 connect your HDMI 1.3 source to the sender unit. The display plugs into the back of the receiver unit. 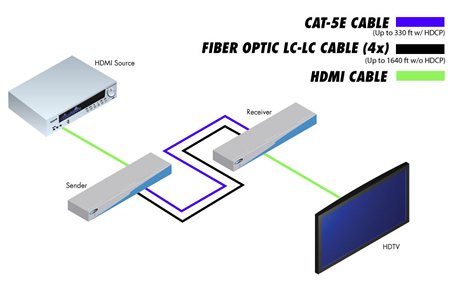 One CAT-5 cable and a multi mode LC fiber optic cable connect the Sender and the Receiver units to each other.